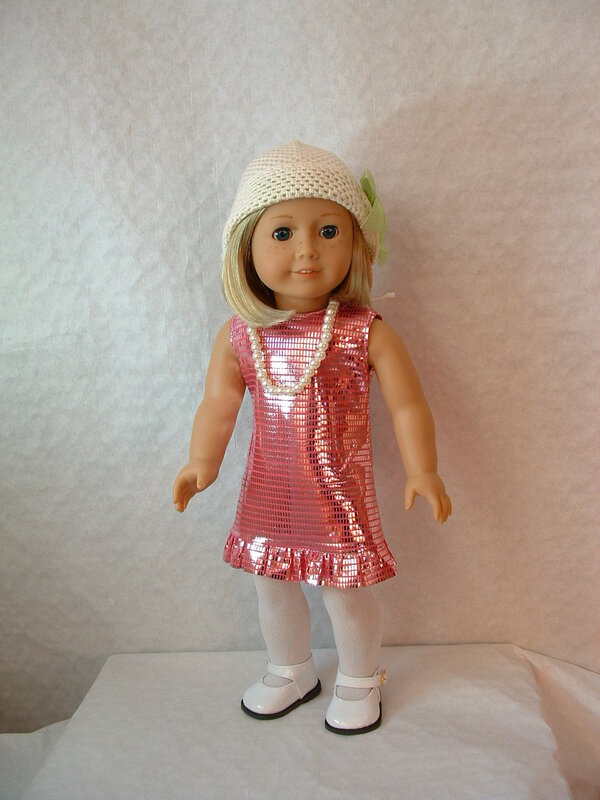 Kit is the 1930s American Girl, so I like to find patterns for 1930s style dresses for her. 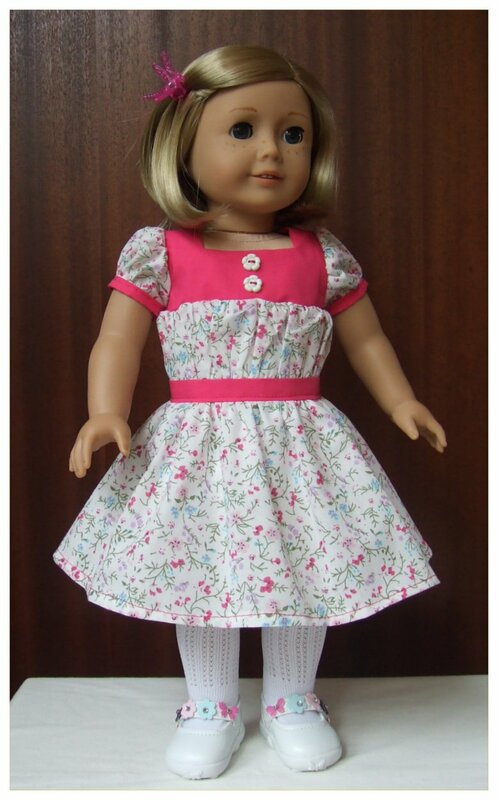 This sweet gathered dress comes from Heritage Doll Fashions which specialises in historical costumes for American Girl and 18″ dolls of a similar size. The dress features a square yoke, short puffed sleeves, and a full skirt gathered into a waistband of the same colour as the yoke and the sleeve cuffs. Two little buttons in the shape of flowers decorate the yoke. Kit wears it with her white lace look socks from Nellie Rose, and her favourite white butterfly Mary Janes by Gotz. The flowers and butterfly on the ankle straps match perfectly the various colours in the dress fabric. Her hair is held in place by a dragonfly clip. She looks all ready for Sunday tea in the garden on a summer’s day. 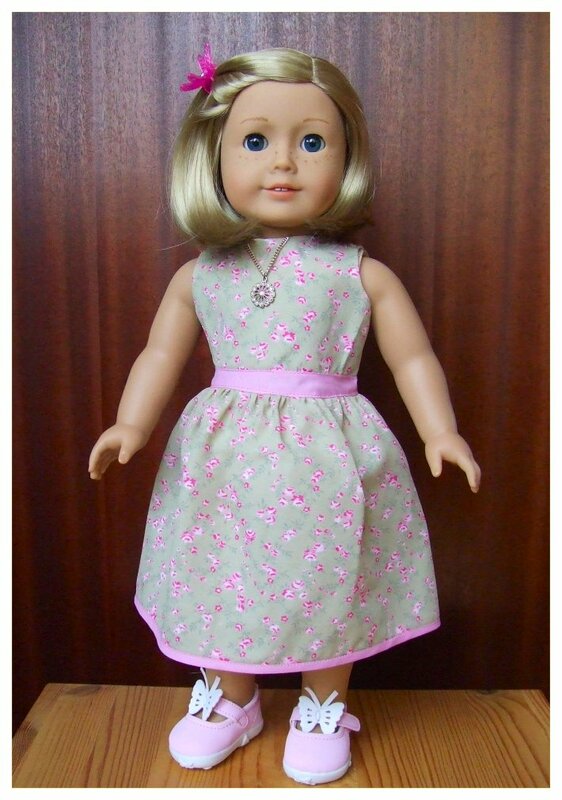 I found this pattern on the Liberty Jane site, which has a huge selection of patterns for American Girl and other dolls. As with Rosie’s patterns, you buy online and download the pattern and instructions as pdf files. After working with several of Rosie’s patterns and through her sewing course, I had gained tremendously in confidence and I was pretty sure I could manage this. The pattern comes with full, illustrated instructions and I could see it was quite complicated, but I thought I was equal to it. I went to my local fabric shop and picked out the prettiest poly-cotton fabric with the tiny all-over flower design, then found a plain fabric in hot pink which matched it. I never wear pink (my colour season is Autumn) so it was fun to work with this pinker-than-pink shade. Back at home I laid out the pattern pieces, cut out the fabric, and began work on the yoke. This was familiar work and easily done. Next I had to make up the sleeves. They were gathered into the cuffs and then gathered into the yoke at the armhole edge. This was a lot of gathering, but I was still confident and all seemed well. So far so good. The dress is designed to look as if it falls from the bodice in one large section which is pulled into the waist with a belt, but this is not the case. The ‘bodice waist’, the part between the yoke edge and the waistband, is cut as one piece, gathered and stitched into the yoke and the top edge of the waistband, then the skirt is gathered into the waistband’s lower edge. That’s a huge amount of gathering! The bodice waist is also lined with muslin to enclose the raw edges and neaten the interior of the dress. It all seemed very complicated and I found myself yearning for one of Rosie’s video demos to help me… Still, it was just a question of working through step by step, surely? And so I gathered and stitched the bodice waist to the yoke. It looked wonderful, neatly and evenly gathered. It was time to try it on Kit to see how it looked. Disaster! The bottom edge of the yoke wasn’t level – it sloped up noticeably from one armhole to the other. 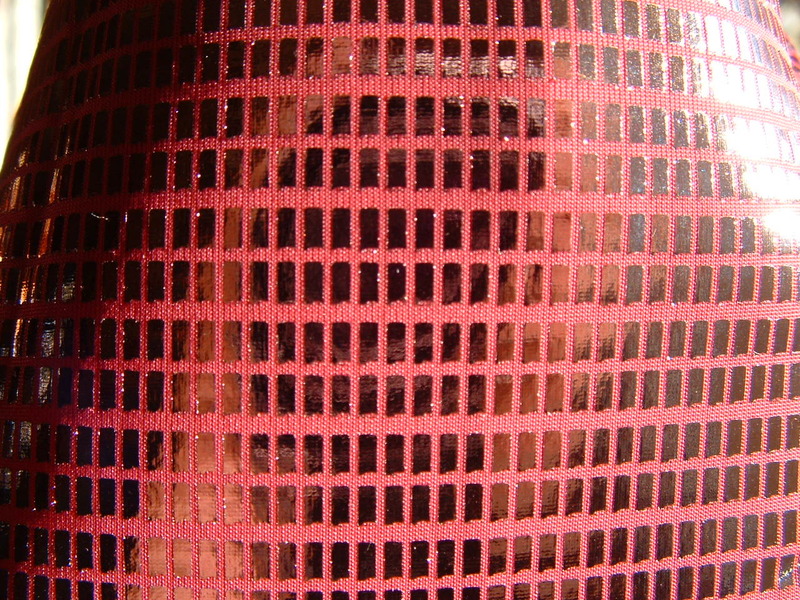 Looking at what I’d done, I could see at the armhole edges that I’d not been completely accurate about my seam allowances and one was 1/4 to 3/8 of an inch deeper than the other. On a normal-sized garment this wouldn’t be noticeable, but on a doll’s dress it’s immediately obvious. For the first time I realised how very important it is when making doll’s clothes to be as accurate as possible with seam allowances. If it’s the least little bit out, it shows. So I ended up cutting out and making up a completely new yoke and sleeves. I was so anxious stitching in the bodice waist, but this time all went smoothly and the bottom edge of the yoke was quite level. Then it was just a matter of doing a vast amount of gathering into the waistband, and fiddling with the muslin lining to make all tidy, hemming the skirt, and stitching the velcro fastening into the back opening. It was such a relief to try it on Kit and find it fit beautifully. There’s no doubt that this has been the fiddliest garment I’ve made so far. But it’s a charming little dress, well worth the effort, and I learned a huge amount from it. This style is just right for Kit and her 1930s friend Ruthie, of course, but I think it would be fine for the 1940s girls Molly and Emily too. These little dresses with a fitted bodice, puffed sleeves and gathered skirt were popular for little girls right through to the early 1960s. I started out all wrong with Kit’s first summer dress: I bought the materials before I had the pattern. I had ordered it from Rosie’s Doll Clothes Patterns, but very untypically there was a delay on delivery (they come by email). While I was waiting I picked out a materials remnant from my local fabric shop. The material was very pretty: a pale grey-green with rosebuds on it, just right for Kit’s colouring. But it was very light and I was afraid it wouldn’t hang well so I invested in some light iron-on interfacing to give it some stiffness. I also bought some pink bias binding for the waistband and the trim around the hem. When the pattern arrived I discovered that the waistband and hem trim should be made using a contrasting fabric, cut on the straight grain, so my bias binding was not right for the job. Nevertheless I decided to go ahead and work with what I had, telling myself that his first dress would be very much a learning experience. (Little did I realise at that stage that every garment is a learning experience!). My first lesson was that type of material is critical to success. I had clearly chosen fabric that was too flimsy. The feed dogs on my new sewing machine grabbed the material and ate it every time I began a seam. I lined the fabric with the interfacing and that helped; plus I found that if I started a short distance down the seam and then backed up to the start it seemed to work better. I’m embarrassed to think of this poor technique now, but at the time I was just grateful to find something that worked for me. Now all I had to worry about was the way the material frayed all the time; and the fact that the bias binding wasn’t really stiff enough to act as a waistband – it was fine around the hem, however. A learning experience indeed! But I was quite pleased with the results, as a first attempt. True, the waistband is not even, but it’s a pretty dress and the interfacing gives the skirt shape and body. Considering it was the first time in 25 years I’d used a sewing machine, and I’d unwittingly done my best to make it as tricky as I could for myself, it really was surprisingly successful. Kit looks pleased with her first summer dress, which she has accessorised with her pink butterfly Mary Janes by Gotz, and a crystal wheel pendant from Nellie Rose. Her dragonfly hair ornament is a clip designed to hold an orchid flower stem onto its support!